The inner twelve-year old boy in me doesn’t know which is cooler: the throne made entirely from swords for HBO’s Game of Thrones series, or the fact that 3D printer technology can now replicate that throne in my home at the touch of a button. It’s an interesting time to be a twelve-year old boy. It may be an even more interesting time to be an intellectual property lawyer because, like the imminent clash in Game of Thrones between the Seven Kingdoms and the evil forces beyond the Wall, promised by the catch-phrase “Winter is Coming,” the intellectual property battles over 3D printer technology are almost upon us. For those of you who still march in the army of Ned Ludd, a brief introduction. 3D printer technology (sometimes known as “additive manufacturing”) works something like this. You create a digital model of any object, either from scratch or by using a 3D scanner. Your computer then sends the model to the 3D printer, which spews out sequential layers of liquid or powdered material that eventually build up (over several hours or even days) and solidify into a real 3D object. The theoretical capabilities of such devices are mindboggling, including obvious applications like architectural models and toys, but also custom chemical compounds and complex mechanical devices such as the open-source “Wiki Weapon,” a working deadly firearm. As of this writing, you can buy one of these printers on Amazon.com, such as the one pictured above, for under $1,000. Earlier this year, Fernando Sosa, a design entrepreneur, created a 3-D printed iPhone dock modeled after the Game of Thrones throne and put it up for sale on his website (http://nuproto.com). 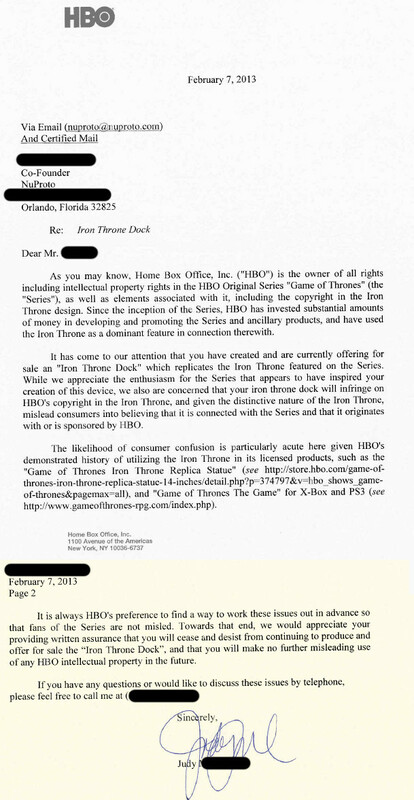 As reported in Wired, HBO’s inner twelve-year old boy was not amused, and sent a polite but firm cease and desist letter to Sosa, implying copyright and trademark violations. HBO rejected Sosa’s subsequent attempts to obtain a license. At first glance, this doesn’t look like anything new. Presumably, HBO pursues unlicensed derivative products all the time, and who really cares how those products were created? Fair enough. But the real excitement over 3D printer legal issues is not about the mundane present, but about the future potential for mayhem as the technology gets better and cheaper. That mayhem may be doubly complex because 3D printer technology arguably involves two types of work: the 3D object itself and the digital model that was authored to create that object. From one perspective, that means two potentially infringing works. From another, two potentially protectable works. So what does the near future hold? Will I be able to walk into a furniture store, make a 3D scan of a chair with my iPhone, turn that scan into a digital model and recreate it on a large 3D printer? If I tried to sell the chair, that may be a Lanham Act violation. But what if I just copied the chair for my house? Is it copyright infringement? Is it fair use? And putting aside the 3D object itself, do I now have a separate protectable copyright in the digital model that I authored in order to create my new 3D object, and what is the scope of that protection? Does the useful article doctrine, which disallows copyright protection for the purely utilitarian aspects of an object, change this equation? Maybe so in the case of a chair, which is clearly utilitarian, excepting any unique design elements (e.g., really cool swords). But just because a chair is utilitarian and not copyrightable, does that mean that the digital model (i.e., the computer programming) used to create a chair is not copyrightable? If you can’t copyright a chair but you can copyright the computer programming used to make a chair in a 3D printer, maybe the future of the furniture industry, and other industries, is inevitably digital. Instead of buying a utilitarian object in the store, perhaps we will license the digital model of the object and create our own copy at home. Sounds crazy, but isn’t that essentially the model we already have for software? These issues no doubt just scratch the surface, and no court has addressed any of them yet. When they finally do, the outcomes are likely to be unpredictable and inconsistent, at least at first. Some commentators already predict that, if existing legal protections cannot provide sufficient shelter from the economic implications of 3D printer technology, corporate America will begin lobbying for the expansion of existing IP law, or even perhaps a whole new species intellectual property protection. Maybe that lobbying has already begun. Winter is coming.